Mumbai, formerly known as Bombay, is India's largest metropolitan area with 20.9 Million people and is the 5th largest metropolitan area in the world. Mumbai, and the neighboring towns of Navi Mumbai and Thane, are located in the state of Maharashtra along the western coast of India. Mumbai is a coastal city on the Indian Ocean. It is in a tropical weather zone and receives over 85 inches (2,200 mm) of rain per year. It has a humid season when temperatures are often above 30 °C (100 °F) and a dry season which is somewhat cooler. 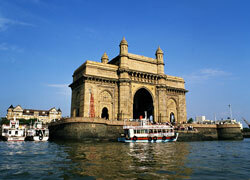 Mumbai is the largest financial center in India and accounts for about 70% of financial transactions. It has large natural deep water harbor that has enabled it to handle over 50% of India's sea cargo. The city is also home to the Hindi film and television industry known as Bollywood. As a result of a thriving industrial and commercial economy, Mumbai enjoys per capita income well above the national average. Ethnically, the major groups in Mumbai include Maharashtrians, Gujaratis, and North Indians. About 80% of the population is Hindu and about 14% are Muslims. There are also sizable communities of Christians, Jains, and Sikhs. In Mumbai / Bombay, Marathi is the dominant language with English and Hindi also spoken widely, too.